The beginning of a new year holds much promise and potential to see those promises realized. Personally I find it hard to refrain form writing unrealistic lists of things I want to accomplish and achieve. A few would include getting in better physical shape, getting more organized (isn't this on everyone's list though? ), blog wise I would like to expand into new territories and I want to find a way to get back to a more minimal lifestyle. Over the coarse of writing this blog I have gone through a personal evolution of style. In the beginning it was very experimental and very handmade so now when I look back I cringe a bit at some of the things I tried or thought I liked. At the same time I accept these failures or experiments as a part of life and a part of the path that has brought me to this moment. Becoming a mother to 1 and then 2 kids has also changed my style but through it all there has remained a common thread of at least attempting to, achieve a more minimal lifestyle. Regularly I fail in this area though, agreeing to buy the kids those impulse toys or snacks that will keep them momentarily quiet, that fad clothing trend that I won't wear for more than 1 season and at home changing things sometimes just for the sake of change. After a fulfilling holiday season with too much food, lots of holiday decor, plenty of traditional activities (by this I mean baking) and even more gift giving/getting, our hearts and house are full. To counteract the excess of December I naturally return to the values of minimalism I began to apply to my life several years ago. Early on my intention was to have a simpler interior style but now it is more than a look for me, it is also about discovering what is truly essential, the things that add meaning, value and not allowing too much unnecessary stuff to come in to take up space or my valuable time. Additionally I have been thinking more and more about what is sustainable and the toll our choices are taking on the environment, on our future. As a parent the choices my husband and I make are having a direct impact on the future as our kids mimic most that we do. 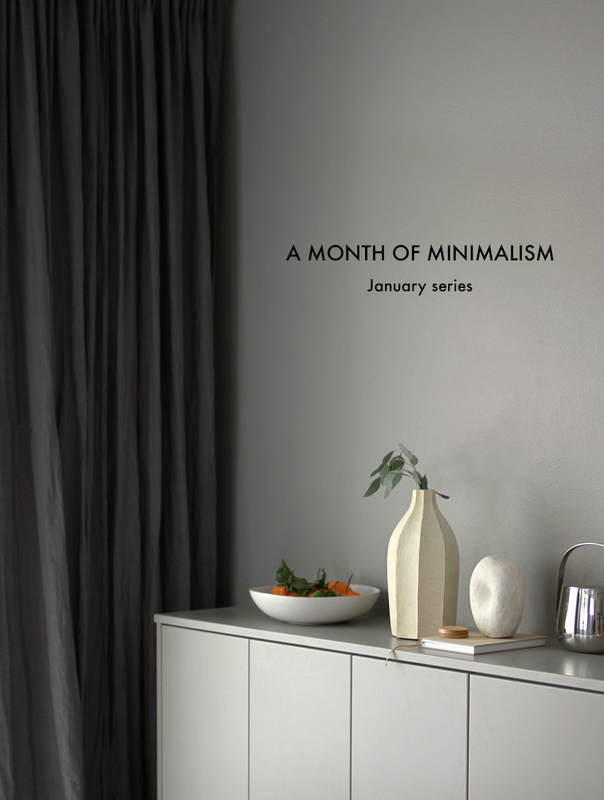 So for the month of January, and to begin the year out on a more thoughtful and purposeful note I wanted to discuss Minimalism with you. What does Minimalism mean? What are some different life applications? How does this affect children, the way we eat, the choices we make? What are some different ways of achieving a more minimal interior without being boring or too sparse or cold? How can these values become a part of our everyday decision making, reducing stress and helping leave a smaller global footprint? These are just a few topics I'd like to discuss with the help of a few friends who will lend their voices to the conversation this month. I love this post! Can I ask you--where did you get that vase with the eucalyptus leaves sticking out from it? It's very pretty. Thank you! To me, a minimalism lifestyle is a cultivation of the right mindset, from which our behaviour follows. 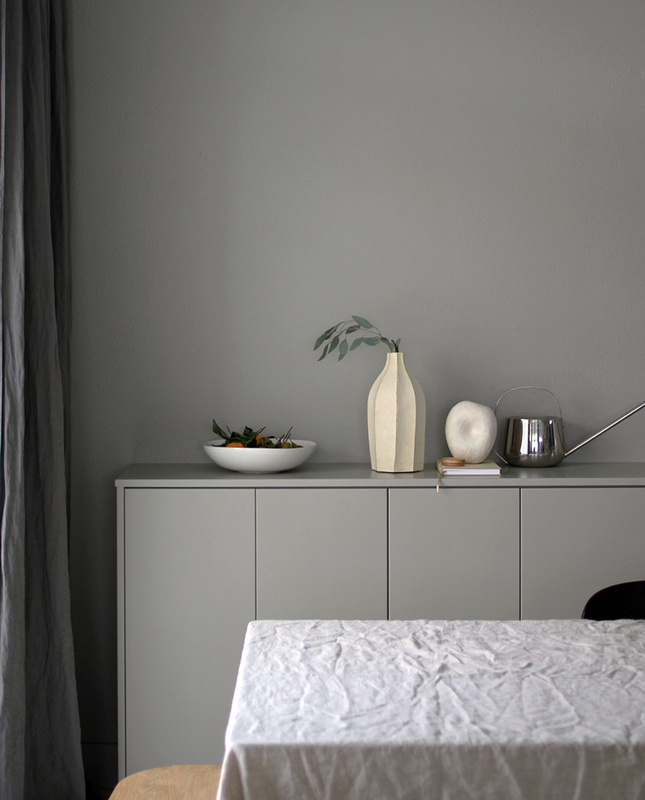 The desirable minimalist look is an after-effect of our interaction with the surroundings. Minimalism is not only the replacement of existing possessions with brand new decorations. There must be a consciousness that takes into account the design, quality, cost, purpose and impacts. I really look forward to reading your thoughts in this series over the next month! I'm inspired already! i just recently discovered your site and I'm thoroughly enjoying its content. Thanks for sharing.